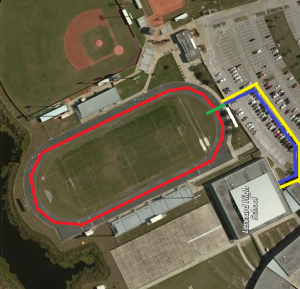 Our next race will be held at Wharton High School, located at 20150 Bruce B Downs Blvd, Tampa, Florida 33647. This will be our first race in 2019 and we hope for a great turn out after the holidays. 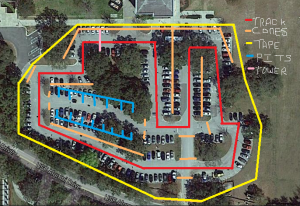 Our course will be located on the south side of the main campus. The first race will lineup at 9:45am and the green flag for the 1 hour race will drop at 10 am. The second race will line up at 12:45 and the green flag will drop at 1 pm. Once the second race is completed, teams will assist with course and area clean up before the awards ceremony. 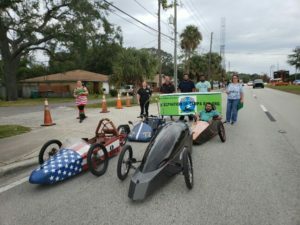 Wharton HS Electrathon Sponsor Chris Hart will have their annual STEM competition on the north side of the campus which allows for an entire day of free STEM activities for the entire family to experience. The Electrathon of Tampa Bay Family suffered a loss earlier this month when Charlie Harrisons, our President, mother Stella M. Harrison passed after a long illness. Her family was by her side at the end. December 8, 2018 Race Day in Plant City dawned bright and sunny with a slight chill in the air. The parking lot at the new 1st Baptist Church was very smooth and fast. We want to thank Pastor Steven Morris and the entire congregation at 1st Baptist Church of Plant City for allowing us to use their beautiful facility. The Advanced Battery Class had all kinds of drama. Before the first race the USF team tried to destroy their 132 car. While they were getting the car ready there was a loud pop and a flash of light along with much smoke when they had a main power wire get pinched and ground out on the frame. 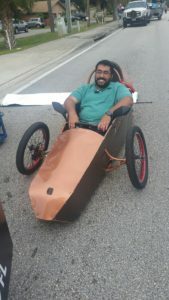 After changing the lithium battery pack they were ready to go, until late in the 2nd race when their right front wheel developed a major alignment problem when the camber adjustment all of a sudden went to 45 degrees. They say it had something to do with a welding job done on that part of the car. It was good to see Drew and Pony of the Electrocutioners and the 72 car back on the track. Drew drove both races while Pony waited to be on call as pit crew. She was very bored during the races until late in the 2nd race when the 72 car started to have body panel problems and she jumped into action with the indispensable roll of duct tape. Cliff and James with Pro EV showed up with the longest trailer I have seen not towed by a semi. They brought a generator and a fancy set of computer operated scales for teams to use to do weight and balance studies on their cars. This is very important information to have to make the cars perform at their best. 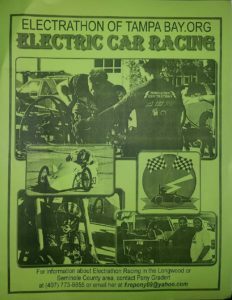 During the races it was Pro EV car 39 and USF car 48 trading 1st and 2nd places in the two races for identical lap totals of 150. USF car 48 took the overall based on time differentials: USF 2.00.38 / Pro EV 2.00.57. In the Open Class Tiger Racing took both races. In the High School Class it was Mulberry High School car 38 taking both races with Simmons in the 53 car not far behind. Simmons had problems with the 35 car and was not able to start the 2nd race. Brooks-DeBartolo, now with the second largest trailer, had problems with their 55 car and spent a lot of time in the pits. They were still able to get it on the track for both races. 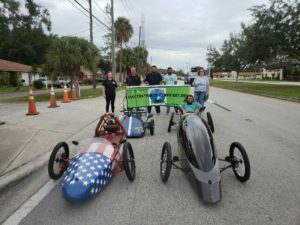 Teams helping teams is on display again: Brooks-DeBartolo did some welding on the ETO loaner assigned to Mulberry High, in turn, Mulberry High will be transferring it over to George Jenkins High School so their team can be ready for the January 19, 2019 race at Wharton High School. Mulberry will be taking the ETO loaner currently assigned to George Jenkins back to their location to put it together for another team, possibly in Polk County Schools. 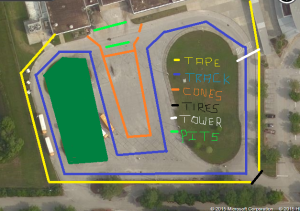 One of the less glamorous parts of Electrathon racing is the track set up and tear down. Charlie and Debbie spent over 3 hours setting it up but with the help of ALL the teams it was taken down and put away in 35 minutes. 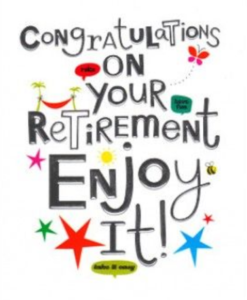 Good News for Fredi Beck, our Mrs. Everything at Electrathon Of Tampa Bay is retiring from the Hillsborough County School System. She will be unemployed starting the New Year. SAD NEWS She and Tom will be moving, sometime in the future, to Indiana where they have bought a house on a lake near family. WHO retires and moves back up North? She is not gone yet and we wish her the best. We will sure miss her when she does go. Our next race is January 19, 2019 at Wharton High School.